The Wellcome Collection is a fascinating place to visit. It is part of the wellcome Trust which was set up by a Henry wellcome, who was a Pharmacist, philanthropist and collector, to be a place where future generations could come together to discover more about human health and medicine. The collection holds many of Henry Wellcome's curious medical items which he collected throughout his life. I can promise you that you will see objects here that you simply will have never seen before and probably never will again. The Body - Showing the latest techniques to explore and see inside our own bodies and all its internal workings. Genomes - Looks at the discovery of DNA and how it may help us to discover new cures. Obesity - A conditions which is threatening thousands of lives in the developed world. Many other curious items are also on display such a Napoleons toothbrush and a Mummified body from Peru, c1200-1400CE. The Wellcome collection has two temporary exhibition spaces which change quite frequently throughout the year. These temporary exhibitions are also free which means that there is always something new to see when you visit the collection. This is a members only library but is open for anyone to join who wishes to study the scientific books available. A small but inviting cafe is situated in the main lobby of the museum which serves both hot and cold food and can be used as a drop in place to meet friends even when not visiting the galleries. 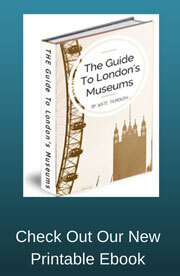 There is also a bookshop which stocks books relating to collections and general scientific matters. There is something for all ages here and I find it a great place to discover new titles and areas of interest to find more about. I am a frequent visitor to the wellcome collection for several reasons, it's free which means I can pop in whenever I am nearby. It always has new and often curious exhibitions on display and its permanent exhibitions continue to fascinate no matter how many times you see them. On entering the Wellcome collection you will be asked to have your bag checked for security reasons but this is over very quickly and the staff are always pleasant and willing to help you find your way around the building. During this visit I decided to start with the permanent galleries on the First floor. The building is very easy to navigate and there are both stairs and a lifts to get you around, there are also lots of signs to help you find what you are looking for and this makes for a very stress free experience. On entering the Medicine Now gallery one of the first objects you cannot fail to notice is a large human shaped blob which is part of the obesity section. Personally I have always disliked this object for the fact that it makes me feel quite sick, it is very realistic but is a sort of monster creation and I believe is designed to represent how being overweight feels and also how fat can takeover and change the human form. You will find quite a few exhibits in this gallery which will not only captivate but may also shock and possibly gross you out. However I would say that it is not displayed to shock but to simply inform and it is done in a very sympathetic way and children will not find anything upsetting, in fact I'm sure they will find it enthralling. Although there are many objects on display I could talk endlessly about the one other I will mention is the "human slice". This as the name suggests is a real slice of a human being (don't ask me how they do it). It is both slightly disturbing and mesmerising at the same time. 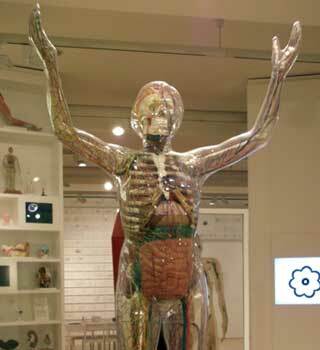 The fluids in the body have been replaced with a plastic so that deterioration is slower so that it can be displayed. Believe me you will stare at this for quite some time, it is amazing. Moving onto The Medicine Man exhibition you will be faced with a very different experience. This room is set up more in a traditional museum layout with objects in glass cases and subdued lighting. You will not be bombarded with information, instead next to each object is a short description of the item and a number. If you want to know more about individual items there are information booklets available to borrow as you walk in. This exhibition is quite simply amazing, every single item on display will intrigue you. All the items are medically related and were collected from all around the world and cover a huge time span. They explain how different cultures viewed health, understood and studied health and medicine and how illnesses and disabilities were treated. My visit to these two galleries took up the majority of my day, however I did visit the two temporary exhibitions on display at the time which were, Mexican Miracle Paintings and Charmed Life: The solace of objects. My visit ended as it always does in the bookshop, with me writing down lots of names of books I will want to buy in the coming year. I always find loads of new titles which I would not necessarily come across in my own local bookshop. A visit to the Wellcome collection is a great day out, it's friendly, fun, fascinating and Positively odd sometimes too but hey that's what I want from my London Museums.